Well, it's been full of awe and there have been wind gusts! 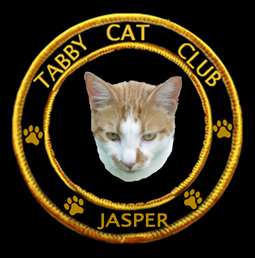 I joyend the Tabby Cat Club! Sandi Claws is looking AWEsome! We've been playing, and playing this AweGust. I'm all king of the junglelike. Dis is my domain. Dis is my AWEsome most fiercest yawn yet! Hoo Cat Jasper you do look rather fierce! So glad you joined the Tabby Cat club. We have all kinds of fun there. Parabéns Jasper, agora você faz parte do clube do gato malhado. You seem to be enjoying a purrfect AweGust! Yep, a fierce yawn, if we ever saw one! thanks for the info very usefull for me. Oh my gosh! Sandi Claws looks just like my mama! And Jasper looks a little like my dad. Do you think.. could we... could we be related somehow? Very nice blog..thank you so much.